Developer Update: I am a student and have exams at the moment. My plugins have not been abandoned and I will pick them up in July and make them more awesome than ever with the 3 months off that I will have. Sorry for any inconvenience caused. Dont you just hate it when you find a large body of water but realize you have no boat to keep going? You could take the risk and swim it, but you might run across some unfriendly jellyfish, or you should run out of food before you ever make it to the other side. BoatLaunch solves all your problems by letting you create boat launches wherever you like. With this plugin there is no need for making or spawning boats, simply press the button and a boat will be spawned in the water automatically! 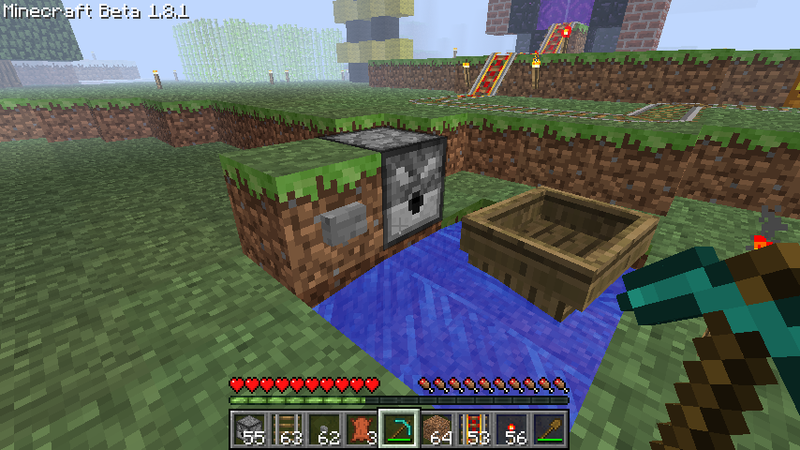 Click the stone button beside the dispenser and a boat is automatically placed in the water. Works with running and still water. Works in any orientation but there must be a water infront of the dispenser and a boat inside the dispenser. Boats dispense normally if there is no water beside the dispenser. Initial release, should work well. Hello, I can't seem to get this to work. I am running 1.2.3-R0.2. and a boat shows up under the dispenser, and then is shot at a high rate of speed toward a random direction away from the dispenser... :( Ideas? Awesome :) will be testing as soon as I can update bukkit and the rest of the plugins.